Following Angel Cabrera’s superb playoff victory against Kenny Perry and Chad Campbell all eyes now look towards the US Masters 2010 event to see who will be trying to wrestle that glorious green jacket from the mighty Argentinean. 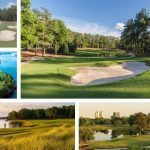 The event always draws some of the most enthusiastic crowds for what is considered to be one of the best designed courses in the world of golf. 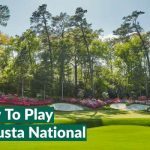 So why does the US Masters bring with it the mystique and glory that warms the soul of every golfer who has had the pleasure of playing the great game? As many of us know the crux of golf is in its clothing, and although some younger golfers may believe a J Lindeberg belt is the most important accolade in golf it is in fact the Green Jacket which winners receive that is the crowning achievement for any golfer. In recent years we have seen an American influence which despite best efforts our European favourites have struggled to break down, 2009 saw Angel Cabrera and his great golf triumph despite the likes of Woods and Mickelson all producing birdies in the last round. The US Masters has a great history of champions including some of the absolute icons of golf. Jack Nicklaus is the most prolific winner at Augusta with a record six victories ranging from 1963 – 1986. It is however Tiger Woods who looks the most likely to challenge his record with four victories, the last coming in 2005. The course has experienced great changes since Tiger Woods’ first victory in 1997, with the course extended to feature new tees and encapsulate more slopes off the tee to ensure that the perfect shot is needed to create a good angle into the undulating greens. Cabrera’s form prior to his victory was far from top of the class, it does however show you that a golfer with solid driving and good ball striking can take victory over the glorious par-72 layout. Victors over recent years have included world number 1’s in Tiger Woods as well as outsiders such as Angel Cabrera, Trevor Immelman and Zach Johnson. Very rarely are we left with a back 9 without drama and with the likes of 10, 11 and 12 amongst the most difficult on the golf course there are still plenty of opportunities to pick up shots over the par-5’s in the 13th (Azalea – 510 yards) and the 15th (Firethorn – 530 yards), however with difficult second shots and water coming into play a bogey is often as easy as a birdie! Here is our quick insight into the back nine at Augusta and why it plays such an integral part in deciding the winner of the US Masters. A sweeping dog-leg with one of the best drives in golf. The fairway slopes from right to left with trees on the left available to collect any hooked efforts. The green is set above the players with a ‘ghost’ bunker some 75 yards short of the green only offering a visual threat for the players. It has historically been the most difficult hole of the Masters tournament. Shaping the ball from left to right off the tee is key to giving you the best angle in for a difficult second shot over water. Despite its length of 505 yards, as it plays downhill it is still possible to reach in two with relative ease. The majority of players bail out to the right to avoid the water, this spot provided the perfect position for Larry Mize in his 1987 playoff with a great chip in to secure victory. One of the shortest holes in major golf, with changeable winds and a green that is set across to you with a very small landing area, it is also one of the most difficult. Masters history includes Fred Couples ball somehow sticking on the slope between the green and Rae’s Creek, and countless bogies as challenges have failed in the quest for the Green Jacket. A demanding tee-shot where the player is needed to shape the ball from left to right to ensure they get a flat position and stance for their second shot. Longer hitters in recent years have started to use 3 woods to ensure this perfect position. It is the second shot which provides the most drama, with Rae’s Creek ready to take any balls short and right and no less than four bunkers behind the green to take any balls slightly longer than perfect. The drive requires the player to get as close to the right hand rough as possible to enable the best position for the second shot. The green itself is very undulating so controlling the second shot to get a flat putt is very important. Ideally golfers should hit a fade off the trees on the left for their teeshot. However as the gap between these trees and right hand side is very small and with a large pond short of the green keeping the ball in the fairway is imperative to hitting the green for a birdie opportunity. This was the scene of Gene Sarazen’s albatross in 1935 with “the shot that was heard around the world”. With a green sloping from right to left and a large pond found short of the putting surface. With a wealth of pin positions available for the tournaments play it is Sunday’s which causes the most drama. With the pin back left players are able to hit to the right of the flag and the ball feeds down towards the flag. It has been the scene of plenty of drama including Woods’ famous chip in from being almost dead and buried at the back of the green after a long tee-shot. With a famous landmark found to the left of the fairway in the Eisenhower tree, the Former president campaigned for its removal after constantly hitting it. A very tree-lined teeshot where players must find the fairway in order to get control for their second shot onto a green which slopes to the right with a large fall away. An uphill dogleg to the right which is one of the toughest finishing drives in golf. With bunkers on the left and trees on the right to punish any shots that are less than perfect. The second shot is significantly uphill and with two bunkers ready for an offline approach it is easy to see why this hole proves so difficult for players looking to find a par of better to secure their green jacket. 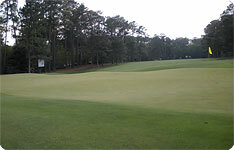 US Masters 2010 packages are available with Your Golf Travel.com. 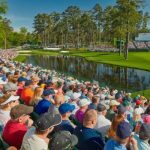 Specialising in , accommodation and holiday packages to the US Masters starting from £1770 including flights, transfers, accommodation and tickets. Great review. I do love Augusta and can’t wait for next year’s tournament. I think we’ll always struggle for a British winner as they don’t seem to have the high ball flights and putting to be able to compete. 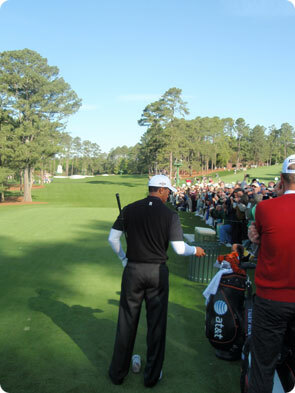 Tiger has the best short game of anyone and shows why he is able to put the Green Jacket on more than most people! I think we’ll see Tiger win the 2010 US Masters simply for the reason that he’ll have been injury free for a year and his game is perfect for Augusta (not that its not perfect for every course!). Obviously would be great to see Angel Cabrera come up trumps again but think his odds at the beginning of the week of 200+/1 were accurate given his form prior to the Masters!